You can duplicate any of the posts previously created by you or your team. First, click into an existing post from either the mobile or web app, and tap the “...” button in the top right of the post panel. Then select Duplicate. When you're about to add a new post, you can choose to duplicate all of the entered information into the next post automatically. Before you hit the Post button, just check the Duplicate box in the bottom right corner of the panel. This is similar (but not the same!) to the Post & copy feature on mobile. From the web app, you can also select multiple posts and bulk duplicate them. First, head to any project and switch your Feed to list view. Then select the posts you want to duplicate by checking the boxes to the left. 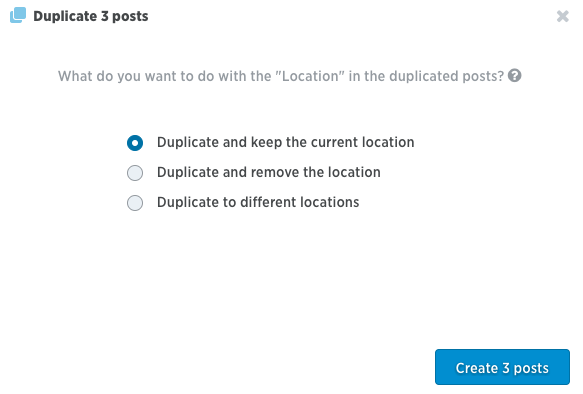 You'll then be able to choose to duplicate your posts to the same location or multiple different locations - or remove the location entirely from your duplicate posts. To duplicate your posts to different locations, click Next and select one or more locations you wish to duplicate your posts in. All the information entered in the original post will be carried over into the duplicate post - including Title and Description, Assignees and Due Dates, Locations and Categories, Post Flags, and Media. The conversations and reactions in the original posts, however, will not be copied. Need to tweak something? No problem. Any of the information in a single duplicate post can be edited before you hit the post button. Duplicate posts are often used in conjunction with Void in Fieldlens. If you’ve noticed a mistake in your post that you don’t want to use the edit features to fix, you can Duplicate the post, fix any problems in the new one, and then Void the original -- removing it from your Project Feed and reports. You’ll be able to go back and view these voided posts at anytime using the quick filters at the top of any Project Feed.